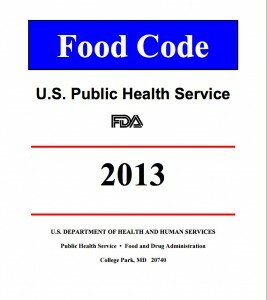 This model is offered for adoption by local, state, and federal governmental jurisdictions for administration by the various departments, agencies, bureaus, divisions, and other units within each jurisdiction that have been delegated compliance responsibilities for food service, retail food stores, or food vending operations. Alternatives that offer an equivalent level of public health protection to ensure that food at retail and foodservice is safe are recognized in this model. This guidance represents FDA's current thinking on safeguarding public health and ensuring food is unadulterated and honestly presented when offered to the consumer. It does not create or confer any rights for or on any person and does not operate to bind FDA or the public. This guidance is being issued in accordance with FDA's Good Guidance Practices regulation (21 CFR 10.115; 65 FR 56468; September 19, 2000; revised as of April 1, 2008).